Firstly, I would just like to say how excited and privileged I feel to have been chosen to be a Brand Ambassador for Muddy-Footprints and have the opportunity to write this guest blog post to meet all you guys that have muddy footprints daily whether that is walking your dogs, seeing to your equines or you just generally love getting muddy on country walks! 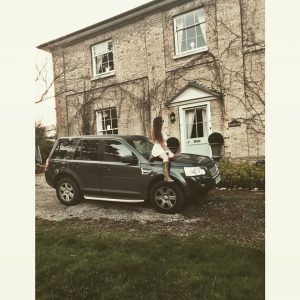 I am Francesca, a 24 year old Equestrian & Lifestyle blogger and I am from the East Of England. 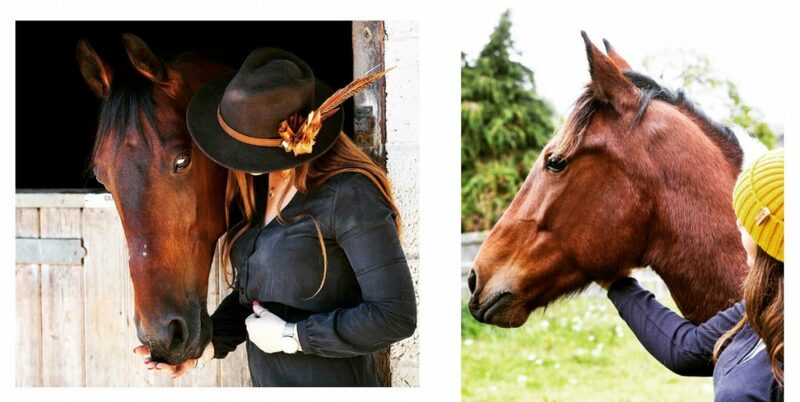 I own two beautiful standardbred horses.. Buddy, a 16 year old 15.2hh bay gelding and Adie a 4 year old 14hh skewbald gelding. I have owned Buddy now for two and half years and he was my first horse. He taught me everything I needed to know in regards to owning my own horse and he has got me through some pretty tough times in my life to say the least! I didn’t think I would ever want to own another horse as Buddy is a once in a lifetime horse and I am so lucky to own him.. Until I saw Adie advertised on the RSPCA website and had to invite him to the equine family! Adie was neglected and left for dead, minutes away from the end when a dog walker found him and against all odds Adie managed to fight for his life and make it through and I am lucky enough to be the proud owner of such a lovely pony now. I have had Adie around 2-3 months now and our bond is growing daily and I hope to have him backed after Christmas – I see a bright future for us! Although I do not compete my horses I like to keep them well groomed and in shape. I ride Buddy for fun, mainly hacking and some schooling. He would rather just eat and be groomed all day.. He is a very affectionate horse that doesn’t really thrive off of exercise, but thrives off of cuddles and human attention.. But he is beautiful and that is why he is used for equine photography! We have done a couple of photoshoot’s for different companies and events now which is really exciting! Adie made his debut in equestrian modelling for Muddy-Footprints new Rugby shirt and he took it in his stride so I am sure you will be seeing lots of my boys over the Muddy-Footprints website and social media pages. The two equines aren’t the only animals in my family.. 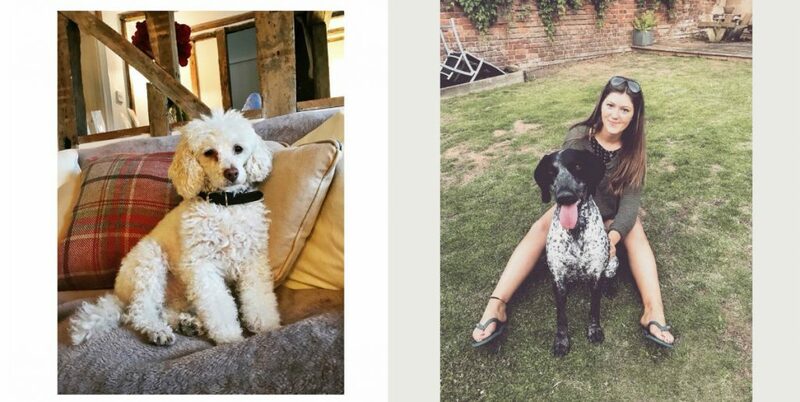 I have an 8 year old Toy Poodle called Bella and a 1 year old German Shorthaired Pointer called Juniper. Although Juniper lives with my dad she is very much involved with my country lifestyle and spends a lot of her time down the yard eating horse poop and chasing them around the fields which is always entertaining! We hope to get Juniper gundog trained and take her beating this season some time! So you are all probably wondering why I chose Muddy-Footprints (or they chose me) – First of all, I love the logo and branding, it’s so creative and hits every market within the country sector. I also love the fact that Yasmin had her dreams and grabbed them with both hands and made them reality! It reminds me of when I started my blog.. I have never looked back! I love the fact that there is something for everyone in regards to clothing, accessories or homeware and the prices vary! 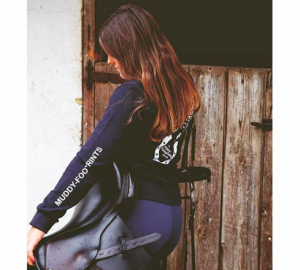 They have some more premium brands such as noble outfitters (Which is my favourite) and they also stock their own designed products and do embroidery for their sponsors and ambassadors which is a really lovely touch to get the brand known! I am super excited to be working with Muddy-Footprints and can’t wait to see the company blossom! I love supporting local companies and what better one than Muddy-Footprints! As I attend many country and equestrian events I cannot wait to sport my Muddy-Footprints attire and show it off! Hopefully I can meet some of you guys at some of the up-coming events over at the Muddy-Footprints stall which is super exciting! As I live the country lifestyle to the full I can trial out and review lots of the Muddy- Footprints items in and out of the saddle over on my blog for you guys to see and read about before making your Muddy-Footprints purchases! Head over to my Instagram (FrancescaSimes) or blog www.CountryFrantics.com to get 20% off at Muddy-Footprints with my own unique discount code! I cannot wait to see everyone wearing their Muddy-Footprints clothing and be sure to hashtag when you upload to Instagram to be featured on the Muddy-Footprints social media! Previous PostPrevious Autumn is HERE – Horsey & you know it!